The definitions of the principal axis, centre of curvature , radius of curvature , and the vertex , of a convex mirror are analogous to the corresponding definitions for a concave mirror. 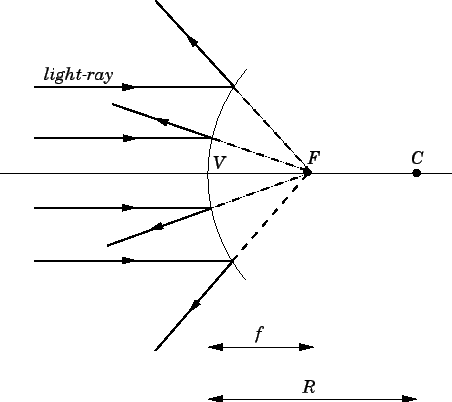 When parallel light-rays strike a convex mirror they are reflected such that they appear to emanate from a single point located behind the mirror, as shown in Fig. 74. This point is called the virtual focus of the mirror. The focal length of the mirror is simply the distance between and . As is easily demonstrated, in the paraxial approximation, the focal length of a convex mirror is half of its radius of curvature. Figure 74: The virtual focus of a convex mirror. There are, again, two alternative methods of locating the image formed by a convex mirror. The first is graphical, and the second analytical. An incident ray which is parallel to the principal axis is reflected as if it came from the virtual focus of the mirror. An incident ray which is directed towards the virtual focus of the mirror is reflected parallel to the principal axis. An incident ray which is directed towards the centre of curvature of the mirror is reflected back along its own path (since it is normally incident on the mirror). An incident ray which strikes the mirror at its vertex is reflected such that its angle of incidence with respect to the principal axis is equal to its angle of reflection. The validity of these rules in the paraxial approximation is, again, fairly self-evident. In the example shown in Fig. 75, two rays are used to locate the image of an object placed in front of the mirror. It can be seen that the image is virtual, upright, and diminished. Figure 75: Image formation by a convex mirror. As is easily demonstrated, application of the analytical method to image formation by convex mirrors again yields Eq. (352) for the magnification of the image, and Eq. (358) for the location of the image, provided that we adopt the following sign convention. 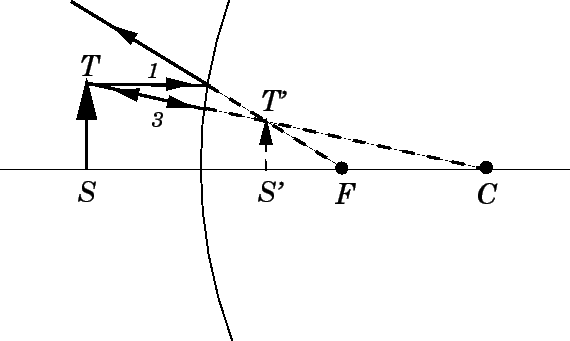 The focal length of a convex mirror is redefined to be minus the distance between points and . In other words, the focal length of a concave mirror, with a real focus, is always positive, and the focal length of a convex mirror, with a virtual focus, is always negative. Table 6 shows how the location and character of the image formed in a convex spherical mirror depend on the location of the object, according to Eqs. (352) and (358) (with ). Table 6: Rules for image formation by convex mirrors. The height of the image is positive if the image is upright, with respect to the object, and negative if the image is inverted. The magnification of the image is positive if the image is upright, with respect to the object, and negative if the image is inverted. The image distance is positive if the image is real, and, therefore, located in front of the mirror, and negative if the image is virtual, and, therefore, located behind the mirror. The focal length of the mirror is positive if the mirror is concave, so that the focal point is located in front of the mirror, and negative if the mirror is convex, so that the focal point is located behind the mirror. Note that the front side of the mirror is defined to be the side from which the light is incident.